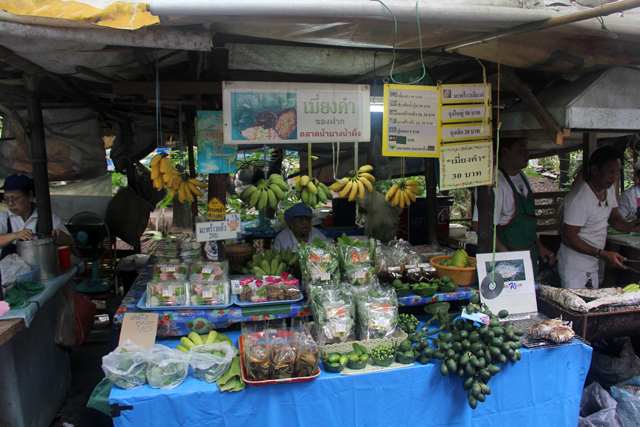 It originated under the cooperation between the Bang Namphueng Subdistrict Administration Organization and local community in an attempt to release their superabundant crops and, as a consequence, create employment and income to the community. The charm of this floating market is the canalside lifestyle of the community whose members are mostly Thai – Mon. OPENING HOURS: Weekends, 8 a.m. to 2 p.m.
Thai floating markets are the perfect way to forget about city life and enjoy the satisfactions of peace and quietness while nibbling through an everlasting supply of snacks. I had been to Talad Nam Bang Nam Pheung (ตลาดน้ำบางน้ำผึ้ง) once before, but had not taken any photos, so finally I returned and here are some photos and information about visiting. 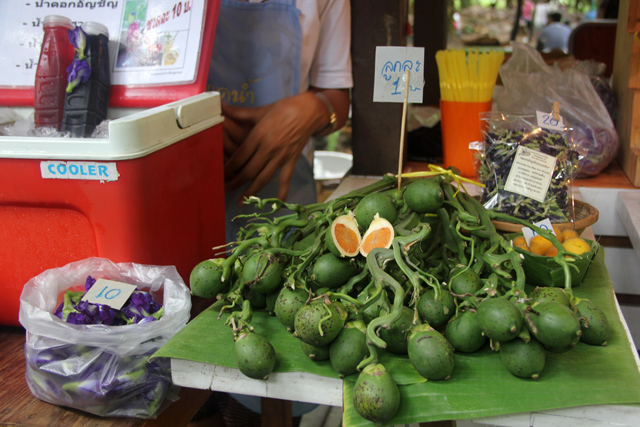 The floating market is local, but not traditional. In other words, it’s set up for Thai residents, but not to handle daily life tasks like floating markets were once used. 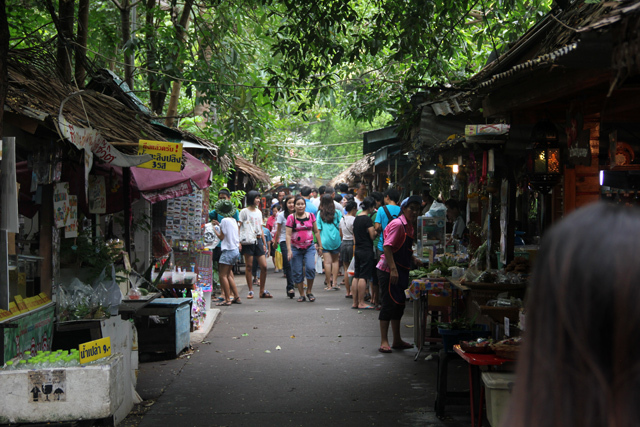 In reality the market is especially for Bangkok residents to escape work and busy city life for the day – a Thai tourist attraction just on the outskirts of Bangkok. There are a number of different entrances to the floating market depending on which direction your arrive from (more on that at the bottom). Just like Khlong Lat Mayom floating market, as soon as you arrive, you’ll immediately be surrounded by little thatch covered stalls selling a wide range of random things. There’s just about everything from trendy t-shirts etched with funny Thai phrases to potted plants. 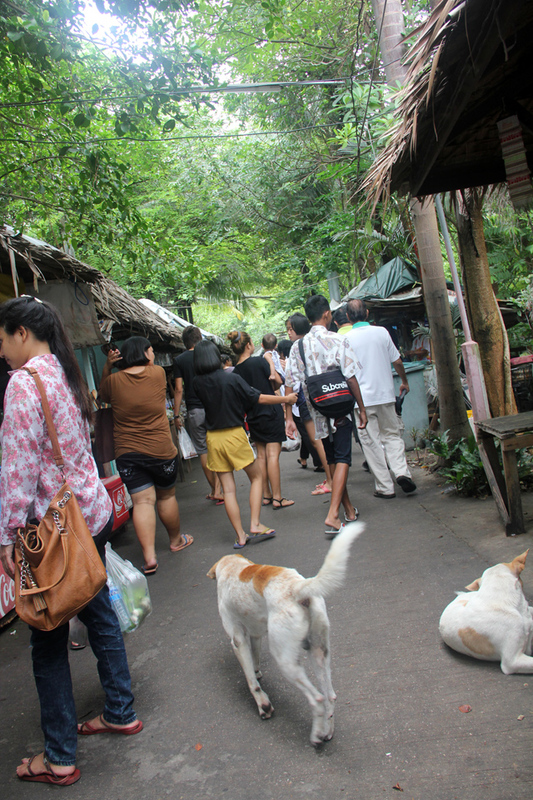 Dog’s of course, are also very welcome at Bang Nam Pheung Floating Market! 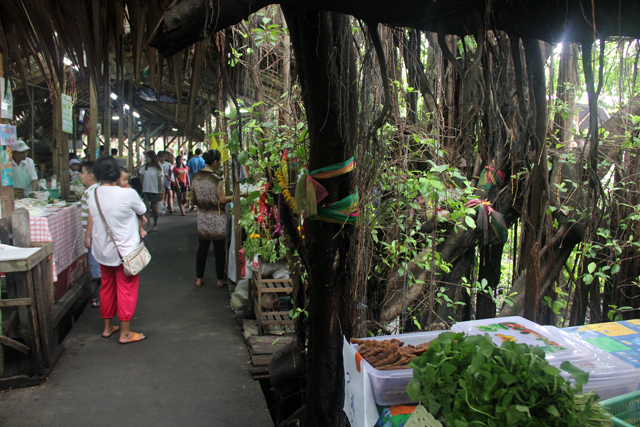 The market is surrounded by lush forest and tropical greenery. Often the foot paths are elevated above water with trees, vines and shrubs all adding to the wonderful atmosphere. 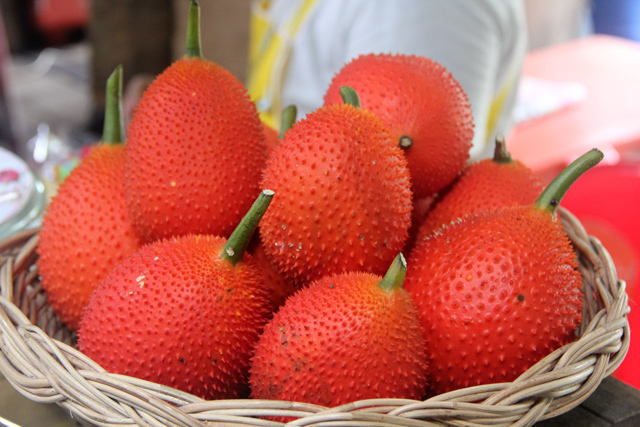 Gac Fruit, is not at all common in Bangkok, but it happens to be something that’s rather famous at Bang Nam Pheung. In fact, you shouldn’t visit without drinking at least one plastic bottle full. The orange colored juice tastes pretty much like a cross between tomato and papaya, quite satisfying in my opinion! There are plenty of vendors selling organic or highly specialized produce as well. As I was saying, there’s quite an assortment of things to buy at the floating market. Here’a shot of a lady selling fresh mahk, or Areca Nut (Betel Nut). Thais really get a kick out of cute little things, so any chance to make something a little more attractive by way of looks, is a great way to get more business in Thailand. At weekend markets like Bang Nam Pheung you’ll find all kinds of snacks and goods in nicer packaging and just set up in a much fancier way than what would normally be presented on the streets. 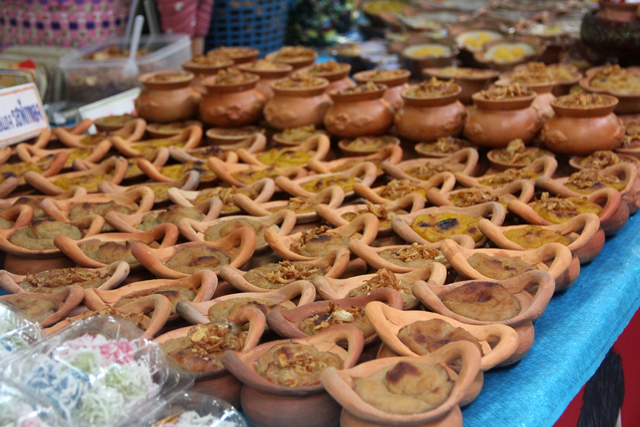 These little Thai desserts were filled into portion sized clay pots. Incredible aromas coming from this pork! 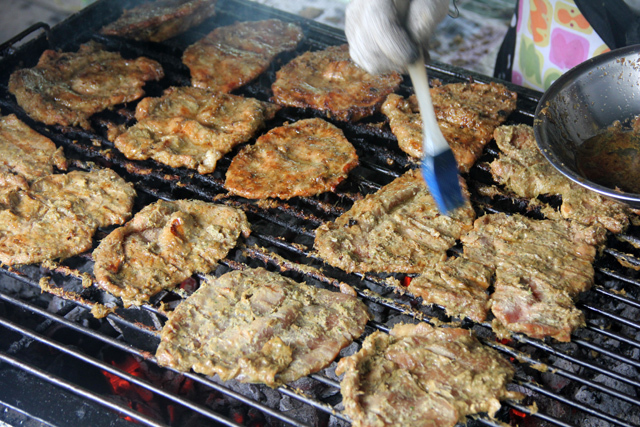 The smell of food is never far away, and something my nose got excited about were these sizzling slices of pork lathered in an unknown marinade that possibly contained lemongrass and ginger. I didn’t actually buy any, but it was outrageously tantalizing. 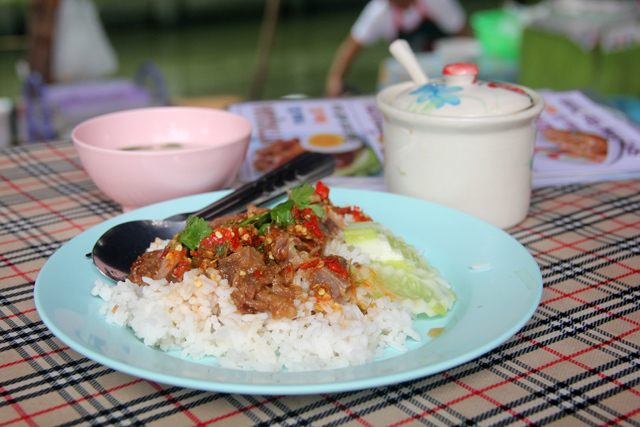 Pork is plentiful at any of the markets in Bangkok and Bang Nam Phueng is indeed no different. 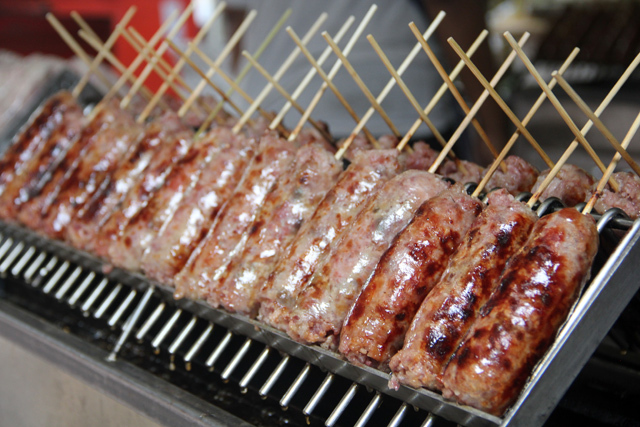 This Thai meat lover’s sausage was hissing away as the flaming embers slowly penetrated the flesh and drops of grease plunged into the furnace. 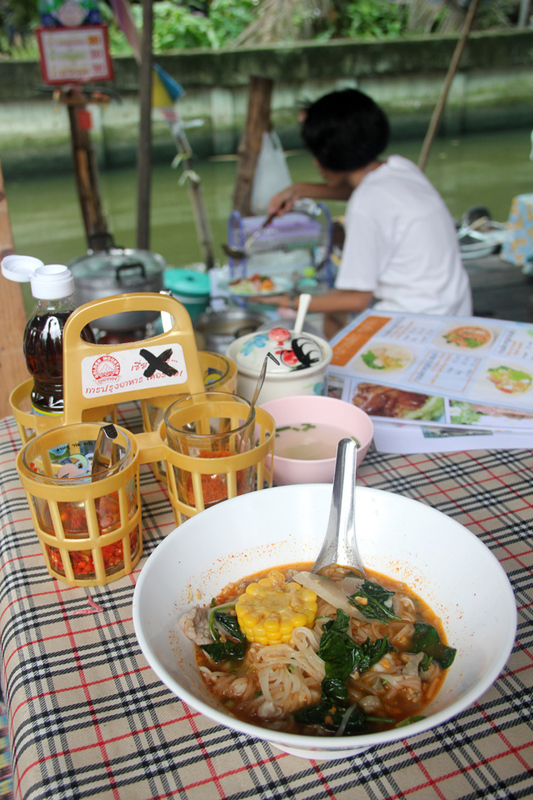 Eating is of course one reason visiting floating markets is one of the most fun things to do in Bangkok! After browsing for close to an hour, it was finally time to take a table along the lazy canal for a bite to eat. I ordered a bowl of Kuay Teow Tamlung, steamed noodles mixed with pork and ivy gourd leaves – almost like spinach. I’d have to say the soup was porky and loaded with flavor. Served from a boat while sitting under the shade of thatch, the atmosphere and my comfort level couldn’t have been much better! I wasn’t going to sit down for just a single bowl of noodles so I also ordered a plate of Khao Moo Op, rice topped with oven roasted pork. The smokiness of the pork in conjunction with the wonderful sour chili sauce was marvelous. If you’re looking for an abundance of boats, Bang Nam Pheung is not really what you’ll be after (you probably want to check out Damnoen Saduak or Amphawa). There are only few vendors boiling noodles or barbecuing satay’s from their boats, and to be honest I think they just set up in a boat, but didn’t actually float there. Despite not having too much floating going on, it’s still a wonderful peaceful place to visit. Also you do have the option to rent a paddle boat if you so desire. 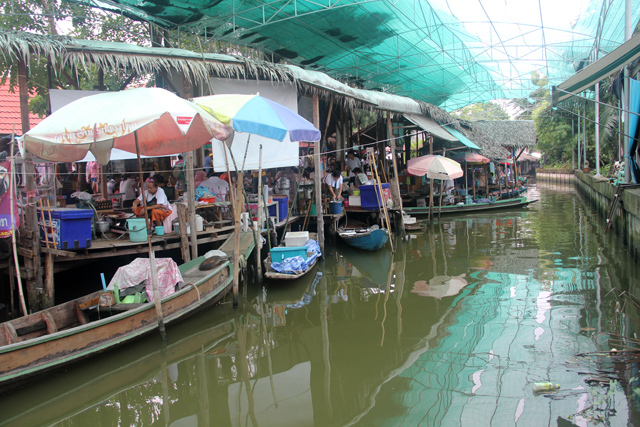 The floating market is located just south of central Bangkok in an area known as Phra Pradaeng, Bangkok’s green lung. 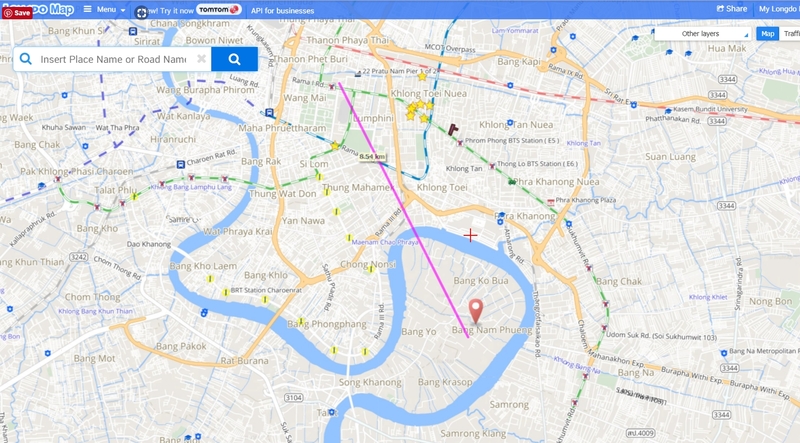 Situated within the horseshoe of the Chao Phraya river, you have two choices of how to get to there. 1. Take a taxi all the way, cross the river by bridge, and follow Rat Burana road all the way into Phra Pradaeng and eventually straight to the market. It’s not too far, possibly 150 – 200 THB (that’s an estimate) from central Bangkok. If you’re not comfortable with speaking Thai, you may want to print out the Thai script of the market. 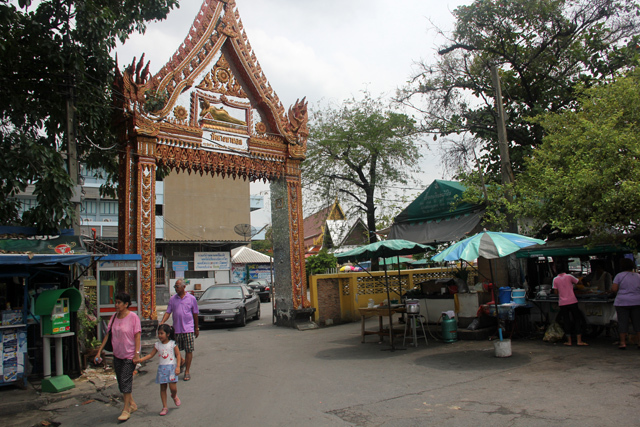 Take a taxi to Wat Bang Na Nawk (วัดบางนานอก), pictured above. The temple is located on the river. 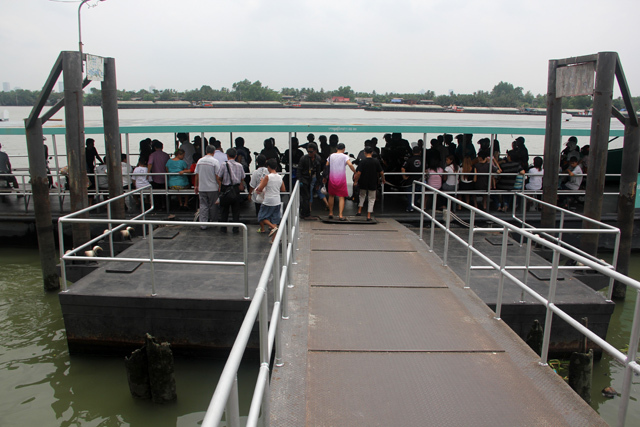 Board the ferry and take it across the river – it only goes one place. Cost is 4 THB. Jump on the back of a motorbike taxi straight to the doorstep of the floating market. There will be many others taking motorbikes to the market as well, so there’s no getting lost. Cost is 10 THB per person. Opening Hours: Saturday and Sunday from 8 am – 2 pm, I showed up at about 11 am. Time: The market is quite large so plan for about 2 – 4 hours of leisure browsing including lunch.